Dr. Wang obtained his bachelor’s and master’s degrees in Mechanics and Fluid Mechanics from Peking University, Beijing, P.R. China, in 1992 and 1996, respectively. He received his Ph.D. degree in Bioengineering from the University of California, San Diego Jacobs School of Engineering in 2002 and continued his postdoctoral work at UC San Diego working under Bioengineering Professor Shu Chien and Professor Roger Y. Tsien in the Department of Pharmacology. He is current a professor at the department of Bioengineering at UCSD and a fellow of American Institute of Medical and Biological Engineering (AIMBE). Before joining the UC San Diego faculty in 2012, he was an associate professor at the University of Illinois, Urbana-Champaign (UIUC), Department of Bioengineering and a full-time faculty member in the Beckman Institute for Advanced Science and Technology at the University of Illinois. He was also affiliated with the Department of Molecular and Integrative Physiology, Neuroscience Program, the Center for Biophysics and Computational Biology, and Institute of Genomic Biology at UIUC. 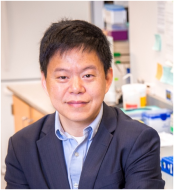 Dr. Wang is the recipient of the Wallace H. Coulter Early Career Award (both Phase I and Phase II), the National Science Foundation CAREER Award, and National Institutes of Health Independent Scientist Award. His research is supported by the National Institutes of Health, National Science Foundation, and private foundations.